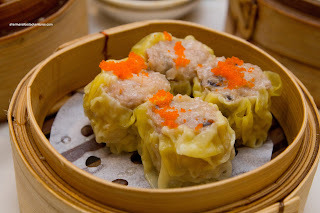 My quest (among many) to try every Dim Sum service in the GVRD has led me to Richmond. Huh? You see, I have exhausted practically every Dim Sum joint in Vancouver, Burnaby, New Westminster and Coquitlam. That meant, I finally needed to start conquering the bastion of Dim Sum in the Lower Mainland. Avoid Richmond no more, I needed to go headstrong into this quest and to accept the possibility of some door dings. Thankfully, we arrived early to our eating destination, Golden Sea City, and snagged a corner spot. Hah! Only one side of my car was exposed to swinging doors! Wait... I guess the other side was prone to a sideswipe! Aiya! I can't win! 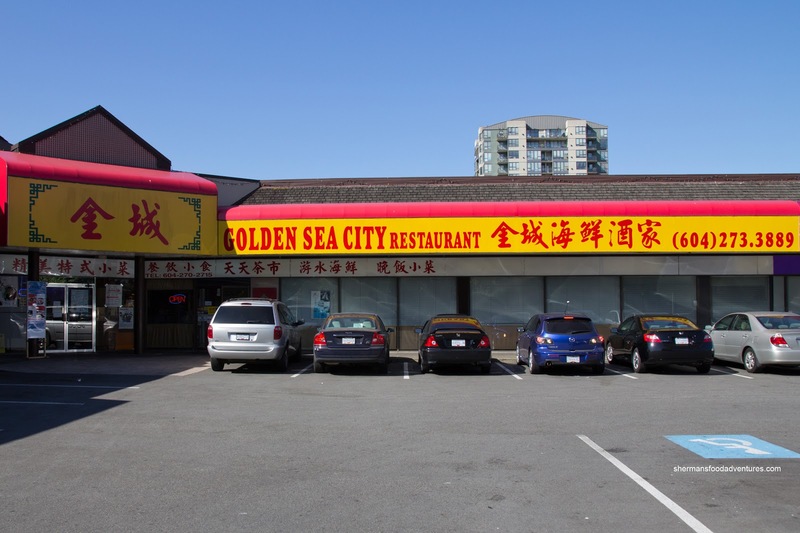 Having gone through several iterations, Golden Sea City is not a fancy place compared to its many counterparts in Richmond. Therefore, pricing is a bit lower (but not by much) and the decor is lacking. 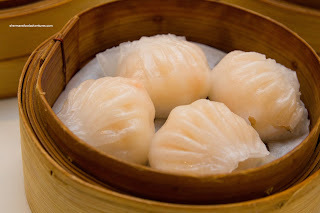 We didn't really care as we were hungry and all I could think about was my poor little car... All alone out there... with those scary luxury SUVs... As for the food, we started with the Haw Gow (Shrimp Dumpling) where the skin was a touch too thick. The shrimp filling was okay, yet could be more bouncy as there was not much snap. There was also too much pork fat as a filler and the flavours reeked of MSG. We found the Sui Mai (Pork & Shrimp Dumpling) to be better than the haw gow. Despite being modest in size, the meat was in big chunks which retained a pork texture while exhibiting a slight bounce. There was enough shiitake mushrooms to make an impact while the shrimp were whole and had a nice snap. 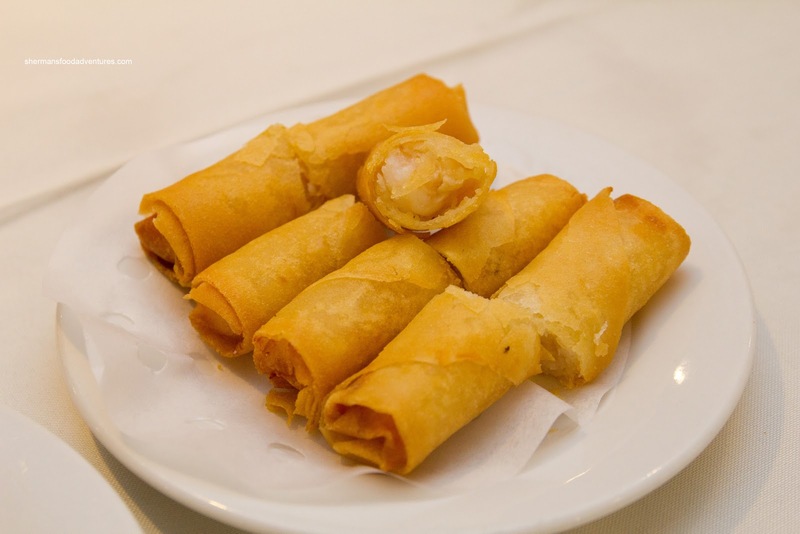 Also exhibiting a nice snap was the shrimp filling in the Spring Rolls. With a modest amount of filling, these rolls were crispy and not-too-oily. There was plenty of garlic to flavour the shrimp. However, we found the shrimp to be both sparse and in small pieces. And on the topic of pieces, there were some pretty lousy ones in the Pork Spareribs. Some were almost completely comprised of fat. Furthermore, the portion size was pretty small. On the positive side of things, the meat had a bite while being moist. There was a good garlic hit with minor hint of black bean. Up next were the Beef Meatballs which looked like a cross between 2 different meats. 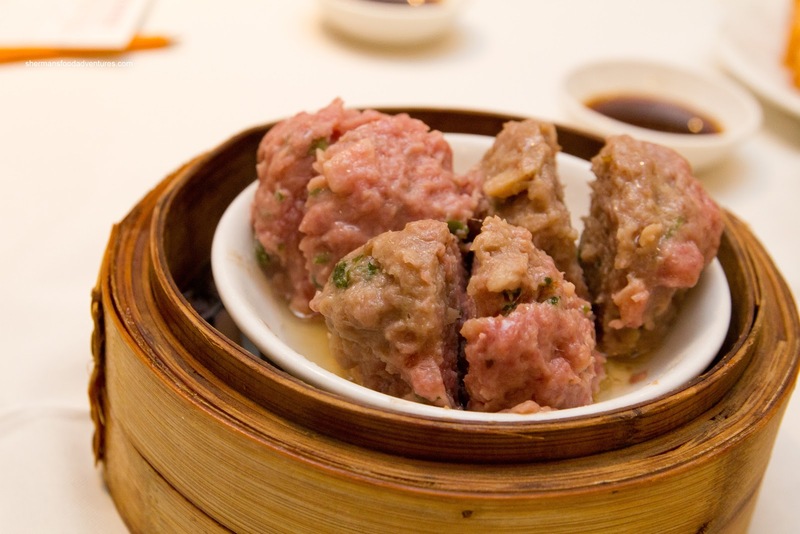 You see, the process of making these meatballs involves grinding the meat down and adding baking soda to achieve a bounce-like texture. The duo-tone appearance was due to a poor mix job where some of the meat received much more love from the baking soda than the other. And due to its overall softness, there was probably too much baking soda in general. With that being said, the flavour was okay while the addition of water chestnuts added a nice crunch. 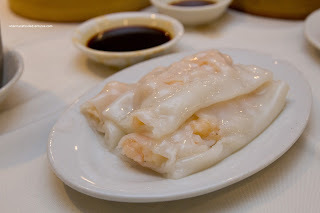 Another strangely-textured dish was the Shrimp Rice Noodle Roll. There was nothing particularly wrong with the rice noodle itself as it was thin and soft with a little bit of resistance. In that respect, the rice noodle roll was prepared nicely. It was the shrimp that was not right. It was downright mushy. Either it was not rinsed enough with cold water or it was just not very good shrimp. Furthermore, there was far too much MSG and salt used where we couldn't even taste the shrimp. The texture issued continued with the Chicken Rice Hot Pot. 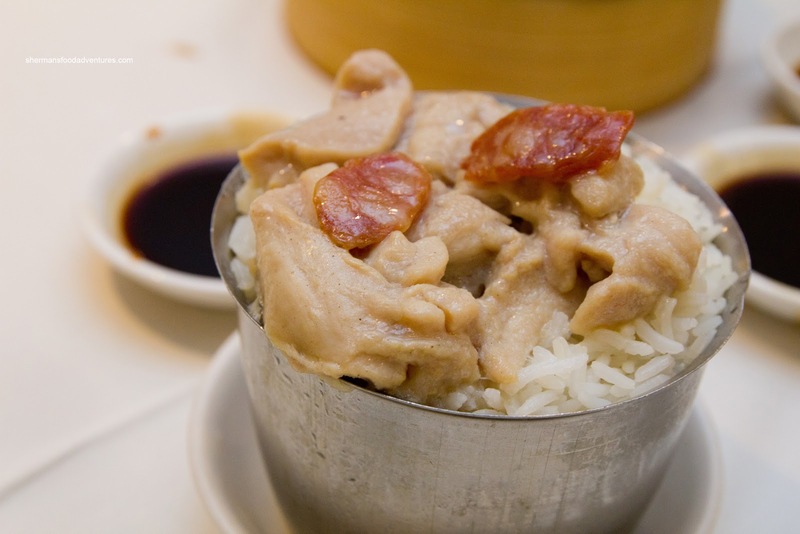 Although there was a plethora of boneless dark meat atop dry & chewy rice (which is not necessarily a bad thing), the chicken itself was over-tenderized which meant it really didn't have much texture at all. Moreover, there was quite a bit of sugar in the marinade as the chicken was pretty sweet. And on the topic of sweet... Do you see a pattern here? 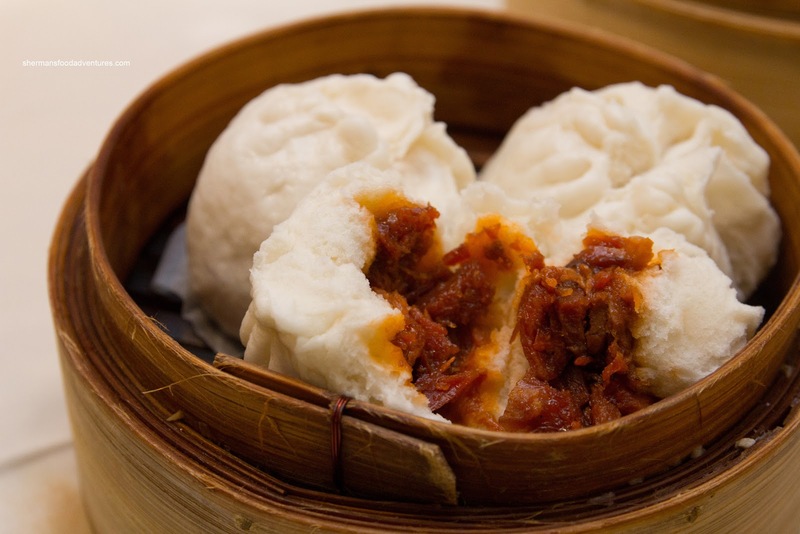 The BBQ Pork Buns were filled with lean pork that was bathed in a really sweet sauce. The actual bun itself was not as fluffy as I would've liked either. Not terrible, but definitely could've been better. 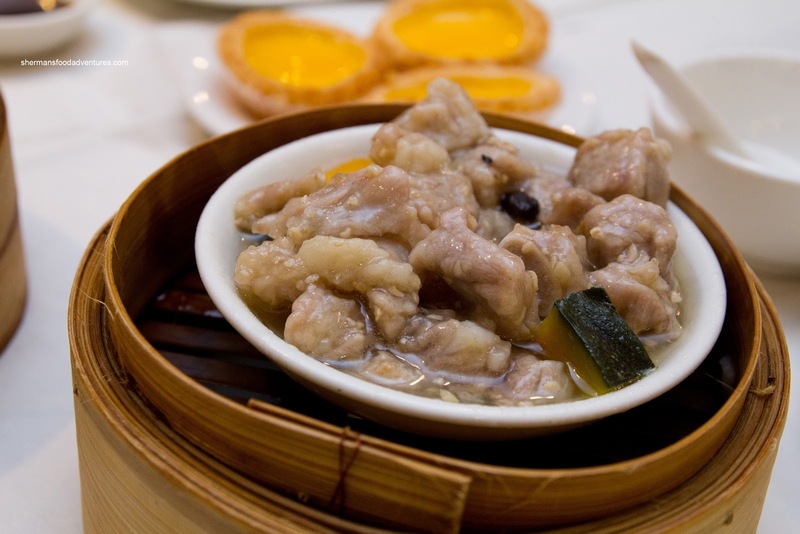 Now for the usual offal dish of the meal being the Tripe and Tendon. 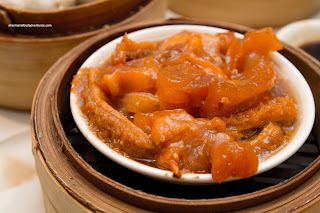 The tripe was tender still exhibiting some chew while the tendon was soft, yet maintaining its shape and texture. The dish was sweet and garlicky which we enjoyed. 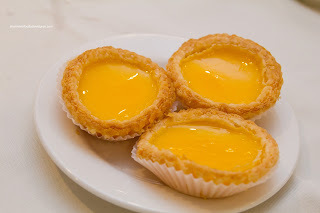 Lastly, and not really the last dish we ate (but I'll talk about it here because it is dessert), we had the Egg Tarts. Judging by its nicely baked appearance, there was some high hopes. Thankfully, it delivered with a flaky shell and soft sweet custard. These were good. At the very least, the meal ended off on a good note. I know I am being a bit picky here, but there was some issue or another with practically every dish we had. Some textures were off as well as some flavours (a bit too much MSG). Moreover, service was pretty average or indifferent (but that is normal for most Chinese restaurants). Hence, with all the great places to grab some Dim Sum in Richmond, Golden Sea City would only serve as a backup plan. Haven't been back there for almost a year. Used to be a regular (even though they were shut down at least twice by for "health infractions"). Last time we were there, a customer was blatantly spitting on the er, carpeted(?) floor. @Teledog Hmmm... that sounds gross.